It's been a doozy of a winter so far in the U.S.
More snow, in some places, than many of us have ever seen in our lifetimes. More ice, more freezing roads, more sub-zero temperatures. In fact, it seems to be that kind of winter in many parts of the world. But there are still a few places where you can find some warmth...along with some intimacy and camaraderie and respite from the outside world. In front of a warm fire with a significant other, for example, in an intimate country inn or B&B, or a beautiful resort. Guest rooms at Canyon of the Eagles are homey and cozy. #5 - CANYON OF THE EAGLES, BURNET, TEXAS - The Texas Hill Country is romantic in itself, with rolling hills and meadows, grazing horses, and fascinating little wineries (yes, this is an up-and-coming wine region!). Canyon of the Eagles is a 940-acre resort on the shore of Lake Buchanan, and the buildings are patterned after homes from the 1920's, with porches, native stone, and board-and-batten siding. There's kayaking and other water sports on the lake. Or, for a relaxing respite, take the two-hour "Canyon Cruise" past stunning geological formations on the lake and the Colorado River, three waterfalls, and wildlife that includes American Bald Eagles, Wild Spanish Black Goats, and an occasional mountain lion. Enjoy a gourmet dinner at the resort's superb Overlook, a hilltop dining room with sweeping views of the Hill Country, and cooking that's just as impressive. Afterward, there's a comforting hearth with a fire and s'mores in the Hospitality Suite. Or, you and your significant other can escape to the romantic swirls of stars overhead on the remarkably-clear evenings, via the research-quality telescopes at the resort. 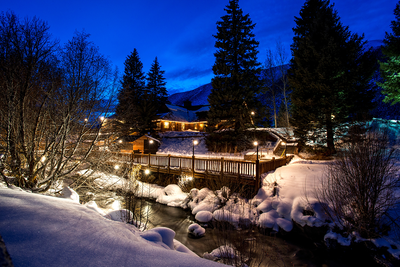 Nighttime is dream-like at Sun Valley. 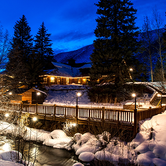 #4 - SUN VALLEY, IDAHO - Sun Valley Resort has been welcoming discriminating guests - and discriminating royalty - since 1936. And it still has everything you need for a "warm" winter weekend...cozy fireplaces, romantic sleigh rides, intimate settings, and beautifully-rustic rooms. 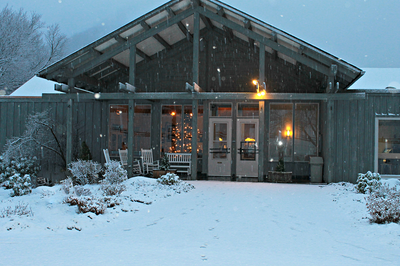 Trail Creek Cabin is a popular restaurant for an intimate dinner here, and a horse-drawn sleigh ride is a great way to get there, as you wend your way through the snowy trails and crisp mountain air. But you won't be cold on the sleigh; you'll be bundled up (or snuggled up, depending upon the company) under heavy wool blankets. Another wonderfully-atmospheric restaurant is The Roundhouse, sitting at nearly 8,000 feet on Bald Mountain, and with a roaring fireplace right in the middle of the room. 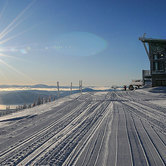 You'll take the Roundhouse Express Gondola to and from dinner under amazingly-clear, starry skies. And you'll be provided with views you'll never forget. 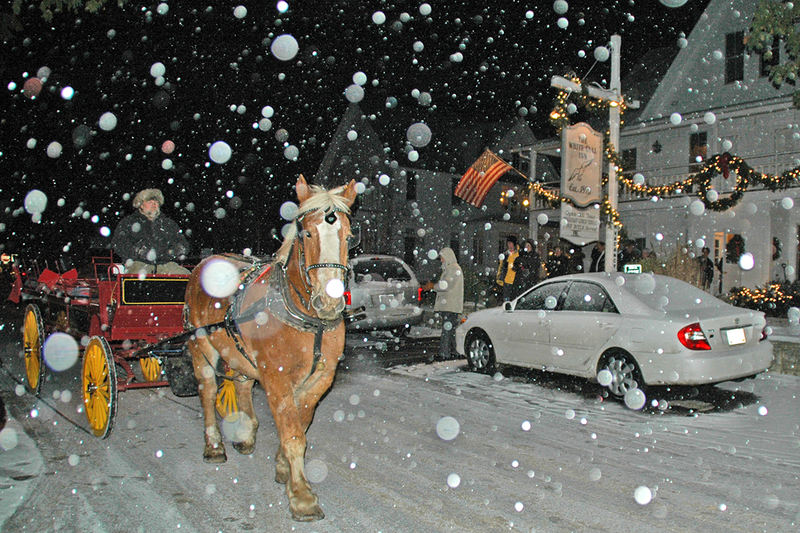 Winter weekends are often a white wonderland at the White Gull Inn. #3 - WHITE GULL INN, FISH CREEK, WISCONSIN - Established in 1896 by Dr. Herman Welcker, the White Gull Inn is a landmark in Door County, which is one of Wisconsin's most beautiful regions. Winter in Fish Creek is especially cozy. Most of the beautifully-restored old rooms and cottages have fireplaces, and many have whirlpool baths. 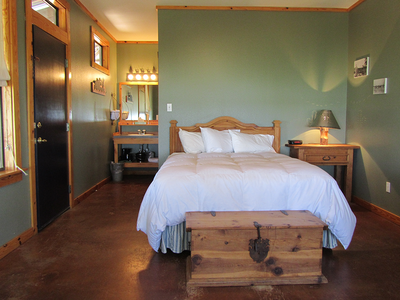 Original antiques and furnishings give the rooms a warm, turn-of-the-century flavor. 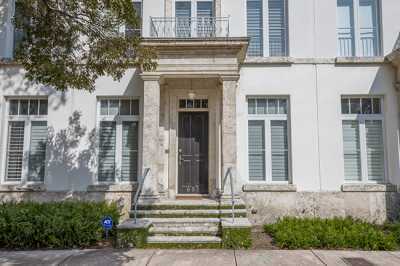 The Dr. Welcker Suite has its own entrance in the main building, along with a living room, fireplace, and a marble-floored bathroom with a hot tub. Start your warm winter weekend with the restaurant's famed Door County Cherry Stuffed French Toast - winner of the "Best Breakfast in America Challenge" on "Good Morning America." And it's not hard to see why the White Gull Inn won the award...the dish is two golden-brown slices of egg bread, with pockets of Wisconsin cream cheese and Door County cherries, served with real maple syrup. The Welcomes Are Warm At the Gateway Inn. 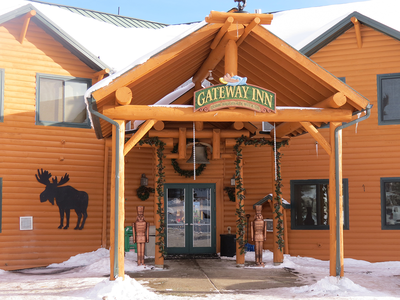 #2 - GATEWAY INN, GRAND LAKE, COLORADO - The family-owned and operated Gateway Inn has become a landmark in Grand Lake in just a short time. And Grand Lake is something of a landmark, too. For one thing, it's one of only two entrances to Rocky Mountain National Park. For another, it's a beautiful alpine town with wood-plank sidewalks and interesting shops and restaurants, sitting on an enormous forested (Grand!) lake. Some travel columnists have called it the most scenic town in America. The Gateway Inn is appropriately-named; it's located right at the entrance to the town. 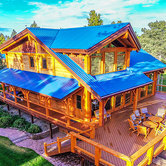 It's built out of pine logs, and offers a rustic elegance with unique furnishings and hand-made furniture. In fact, no two rooms are alike. 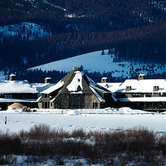 The area is a winter wonderland with snowshoeing/cross-country skiing at Rocky Mountain National Park or Grand Lake Nordic Center, ice fishing, and sleigh rides. Gateway Inn's lounge offers spectacular - and very romantic - views of Colorado's largest natural lake, along with Shadow Mountain Lake and the towering Rockies. You'll never find a more romantic spot in which to relax. And after a cocktail or two you might enjoy the hot tub, sauna, or a massage. It's warm and intimate at the Peaks of Otter Lodge. # 1 - PEAKS OF OTTER LODGE, BEDFORD, VA - This wonderful, woodsy lodge is as "warm" a place for a winter weekend as any in America. It sits amidst the Blue Ridge Mountains, whose ridges float out, one after the other, into an endless multi-colored horizon. In fact, it sits right on the Blue Ridge Parkway, often called "the most beautiful road in America." The Lake View Restaurant has a warm - there's that word again! - country ambience, and serves classic American and Southern specialties. And it doesn't hurt that the restaurant overlooks Abbott Lake. 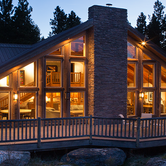 The lodge got its name from the three mountain peaks nearby. And this area is filled with hiking trails through serene mountains and valleys, and you can even take a shuttle ride toward the top of one of those three Otter peaks, Sharp Top. You must make time to take a little jaunt along the Blue Ridge Parkway, where you'll come upon overlooks that stretch out up to fifty miles, filled with picturesque little villages and deep-green meadows and dense forests and distant peaks. Peaks of Otter Lodge is a place to relax and recharge and re-kindle, surrounded by the bounty of Mother Nature. Take your significant other and, if weather permits, take the mile-long walk around Abbott Lake. Or take a chair at the lake and watch the sun set over the Blue Ridge in a thousand different colors. It may be the "warmest" feeling you've had in a long time. Do you have a favorite spot for your own "warm" winter weekends? We'd love to hear about it! Well, the Holidays are over. The caroling is over. The end-of-year merrymaking is over. And so - perhaps mercifully to some - the Holiday gorging and sweet treats and restaurants and huge dinners at relatives' and friends' homes is over, as well. Andy Williams, the great singer (and a number of other great singers, in their times), said it best. This truly is the Hap-Happiest Time of the Year! Christmas is a time for friends, family...and the friends who are more like family. Late-summer, to me, is one of the most beautiful times of the year. The summer heat is starting to break. Nights are a bit cooler. Days start to get a bit shorter. There's a hint in the air of the Autumn breezes that will come soon. Well, the Fourth of July is almost upon us. It's the quintessential American holiday...a day that Americans of all stripes come together to celebrate their principles and their history. It's been a doozy of a winter so far in the U.S. More snow, in some places, than many of us have ever seen in our lifetimes. More ice, more freezing roads, more sub-zero temperatures. In fact, it seems to be that kind of winter in many parts of the world. It's ski season! 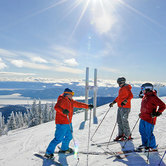 And ski buffs all over America - and all over the world - are busy getting their equipment together, waxing their skis, and looking at their calendars.